Fine exposure, North Buttress, pitch 3. After all the snow and wind of the previous 2 days the job was to find somewhere that was safe to get to and did not have too much snow. 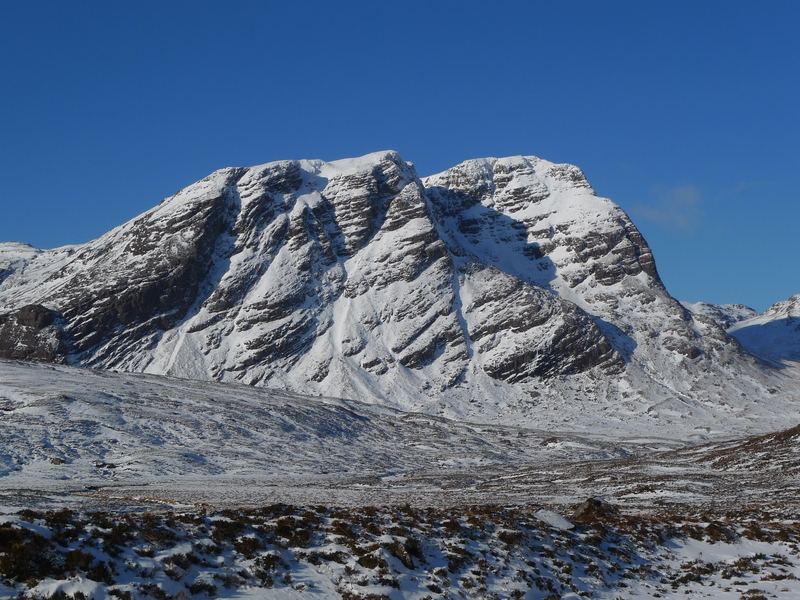 I hoped that the Buachaille would fit the bill. 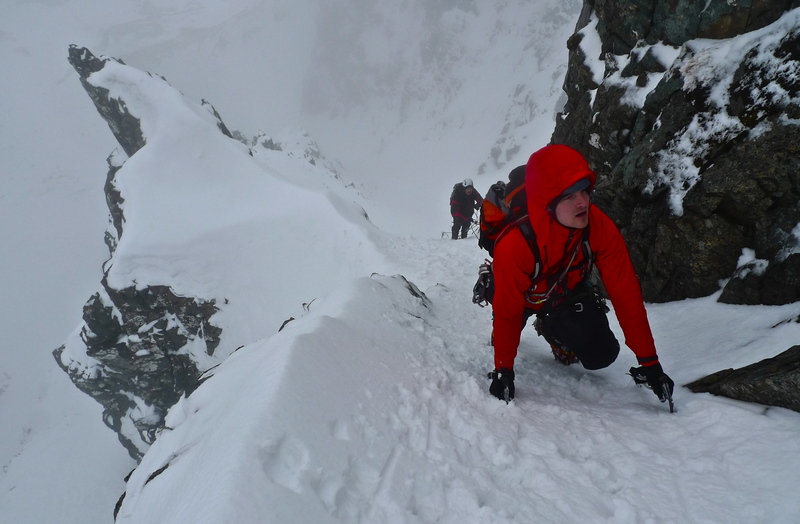 The approach slopes from Great Gully had patchy fresh snow over rock slabs which neccessitated crampons and made awkward going. 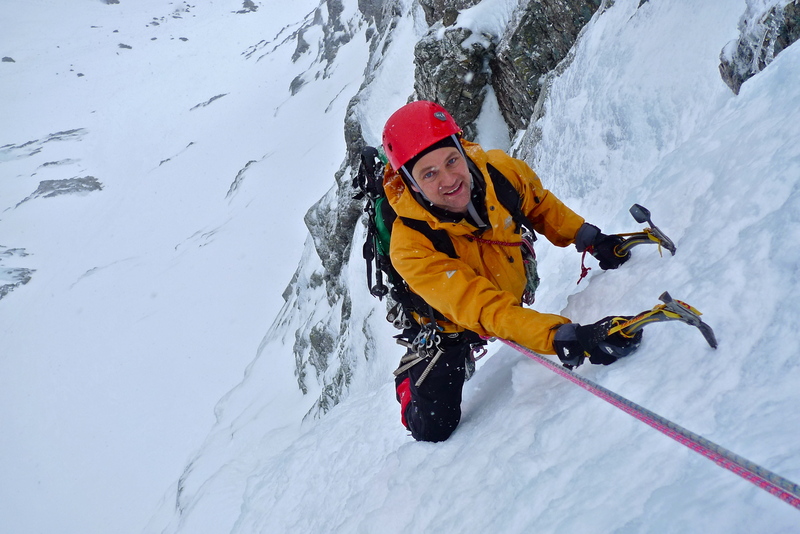 The lower pitches of the route were very dry the wind having blown most of the snow off. 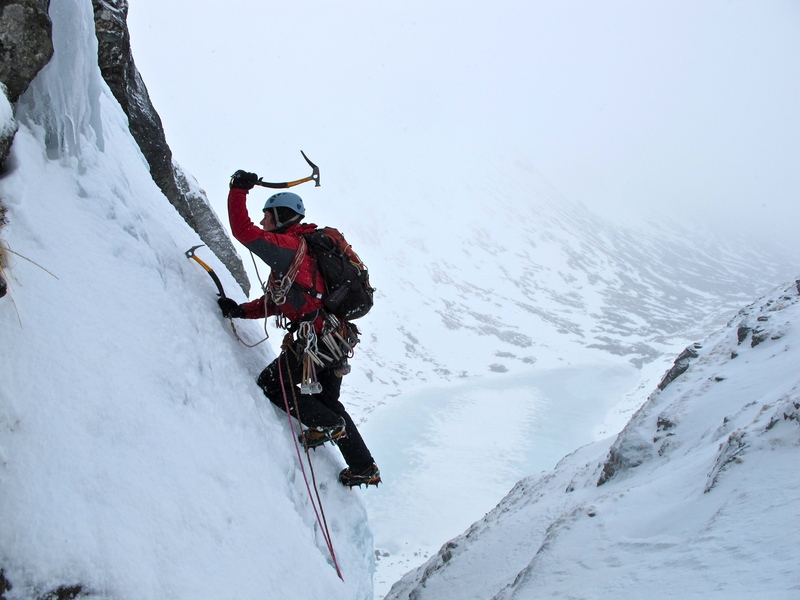 This gave a very alpine feel to the route – dry rock with fresh snow on the ledges and climbing with gloves and crampons. Very different to when I climbed it 2 years ago burried under a huge dump of snow. Higher up as the angle kicked back we encountered firm neve and the rocks were well rimed. With great views appearing between blustery snow showers it really was a fantastically atmospheric day. 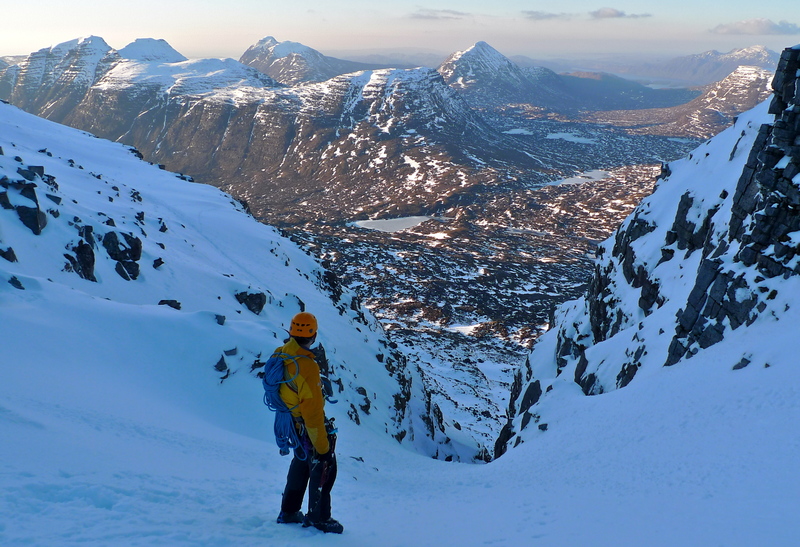 Great view from Buachaille Etive Mor summit. 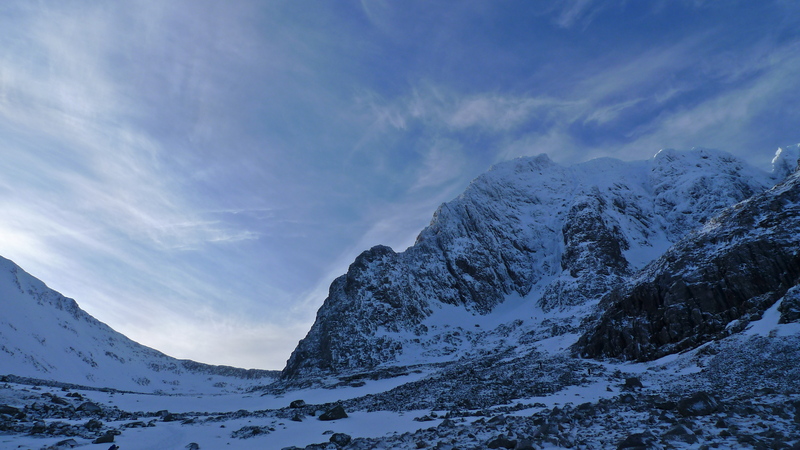 The clear skies and cold weather arrived overnight as predicted and promised good climbing conditions. 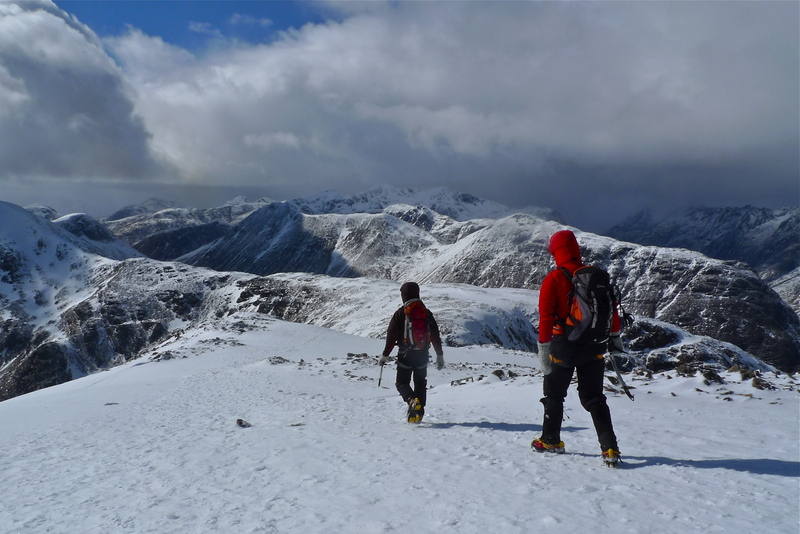 After running up Tower Ridge on their first winter week in February Matt and John had clearly got NE Buttress in their sights. As has been the pattern recently nearly everyone heading onto the Ben today turned right into Observatory Gully and most then for Orion Face. 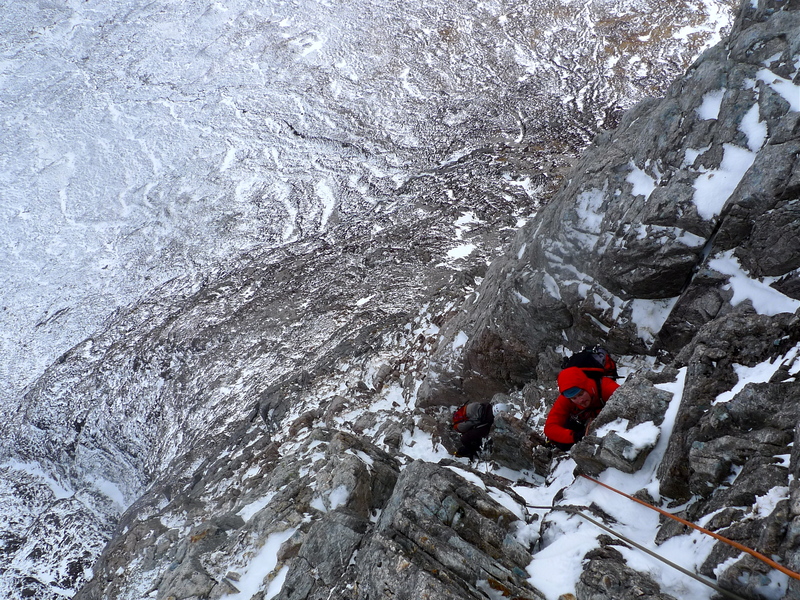 This left just us and one other team heading up to the back of Coire Leis. 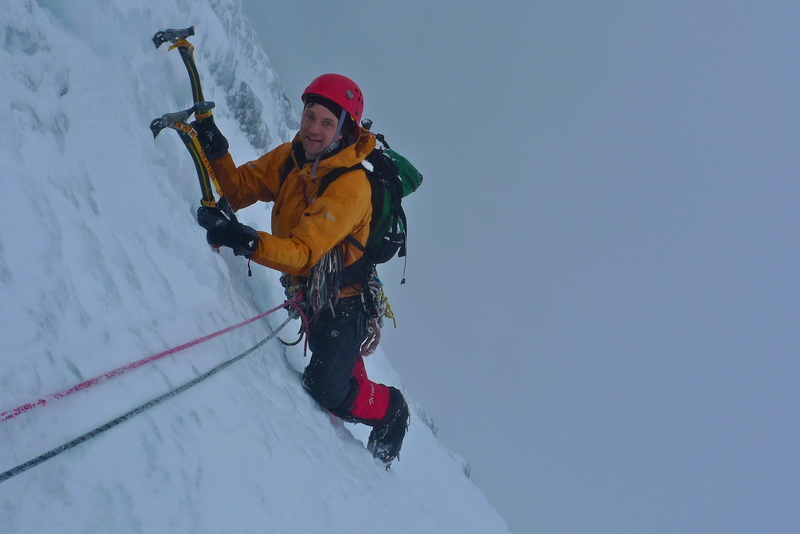 The conditions on the route were generally great with fantastic neve everywhere. I was surprised that there was absolutely no evidence of the route having been climbed recently. We did not see one footstep or cleared stance all day. We were therefore required to do quite a lot of digging and clearing to find gear and belays and also to chop foot ledges at all the belays in the bullet proof neve. Still I’m sure the team behind us were grateful for all our hard work! As a result despite continual steady upward progress we did not top out till around 7pm just as the wind started to pick up the cloud descend and the snow start falling. In light of time we elected to bypass the Man Trap by the icy groove on the right. This and the 40 foot corner were very icy but meant it was impossible to find any rock runners for protection. Heading towards the Red Burn along the summit cairns at around 7.30pm we passed a group of 5 or 6 young lads heading for the summit. We’d passed them all before I realised that none of them had axes or crampons! I did at least see a map and a GPS in the team. I only hope they got down without too much mishap as the light was fading fast and it was starting to snow quite heavily. Matt and John are back for a second week this winter. 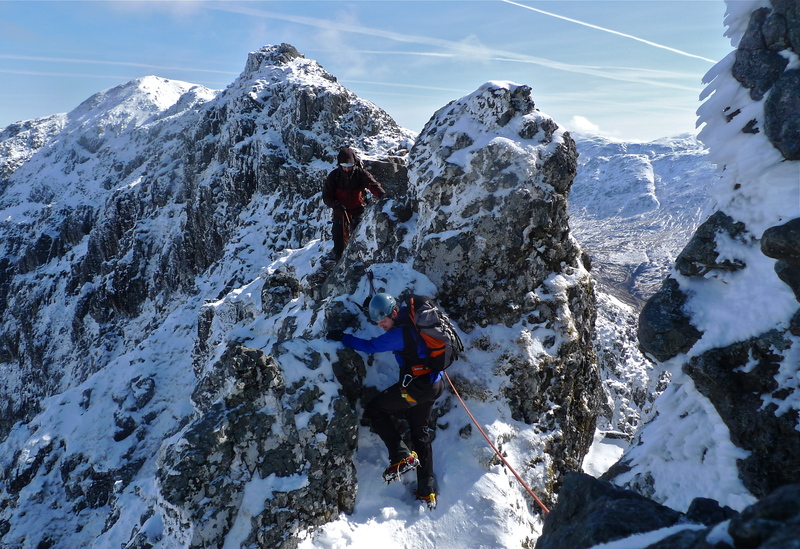 Today they were keen to lead something and Dorsal Arete fitted the bill. It was a showery and blustery day although the wind was much less than forecast and the freezing level was much higher – probably only just freezing on the summit. The guys did a fine job of swinging leads up the route and refreshed all their belay building skills from their summer rock climbing. There were several other teams out in the corrie. 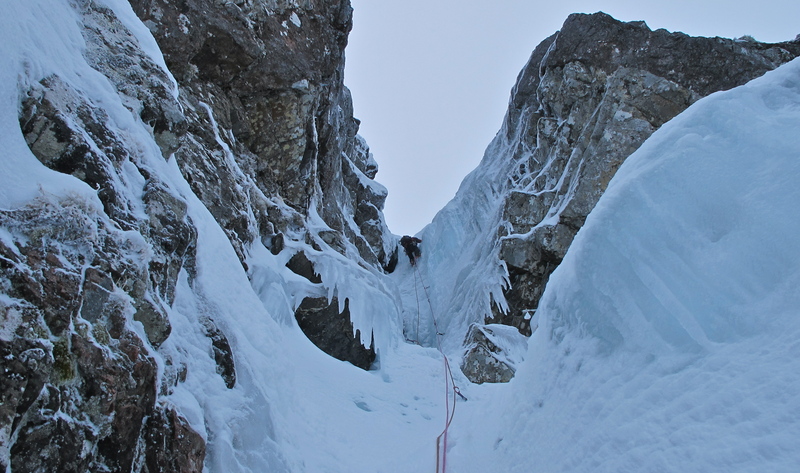 One on Ordinary Route, a couple soloing NC Gully and a team that backed off SC Gully. 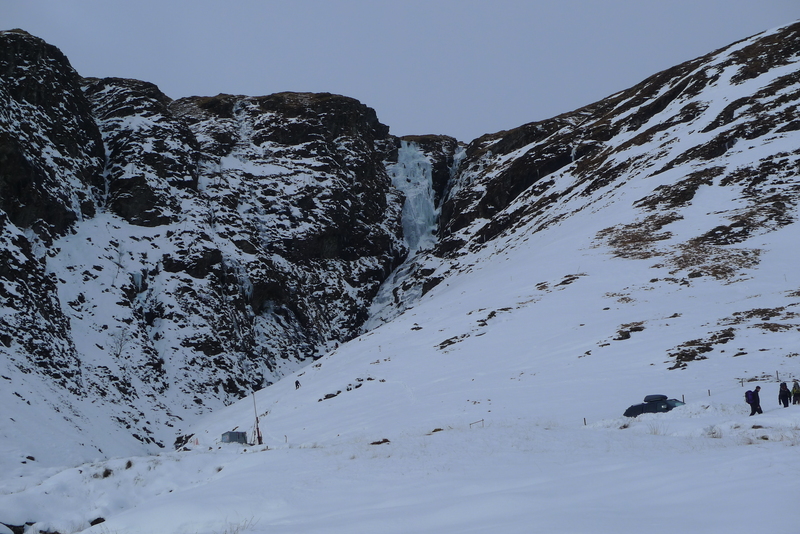 There was some fairly sizeable avalanche debris that had appeared to have come out of Forked Gully. 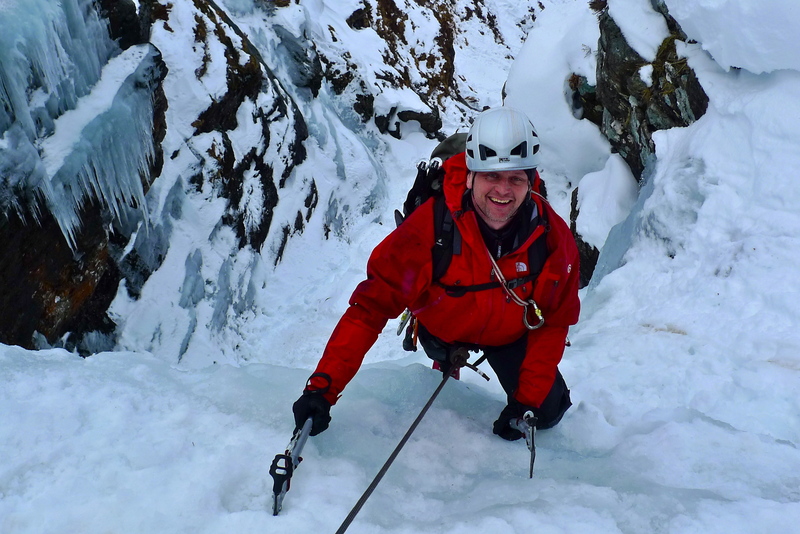 Hadrians Wall Direct, Ben Nevis – Great ice…. and a little spindrift! 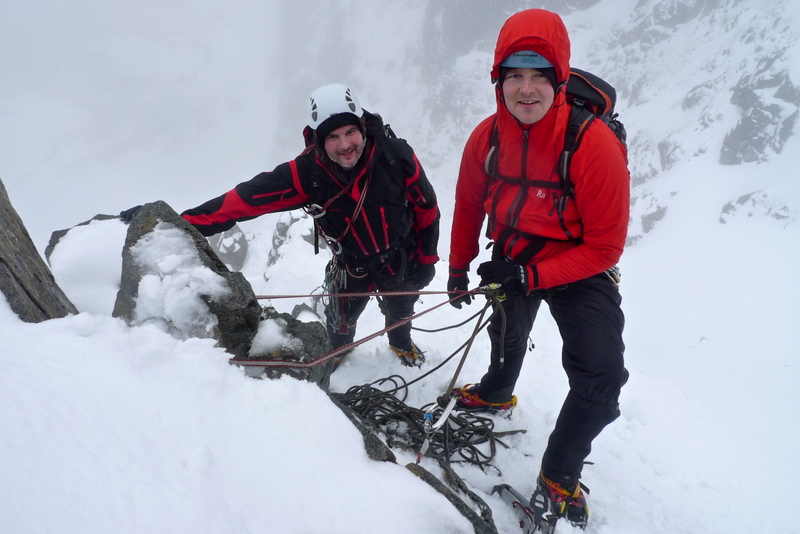 A great day on Ben Nevis today with an old friend. Lance and I got an early start to beat the queues and headed up Observatory gully to see what routes were free. We had thought about Sickle but with a team just starting it we opted for Hadrians instead. 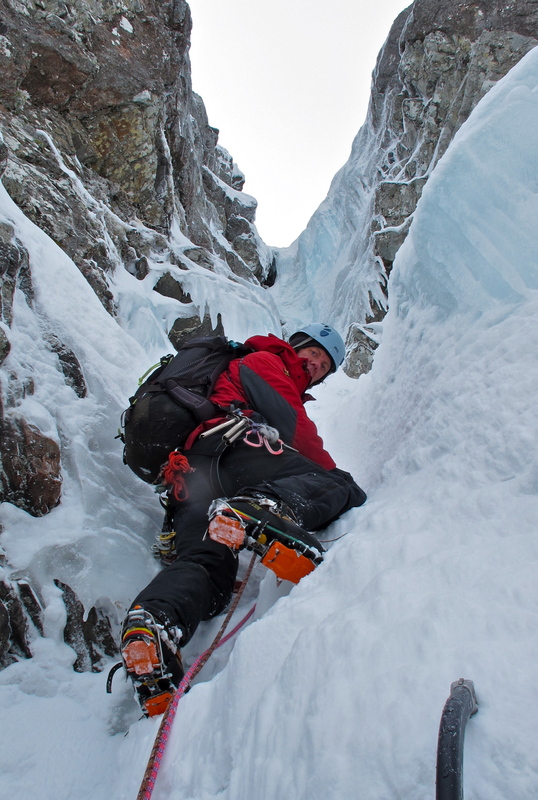 The ice on the initial steep pitches was brilliant. Good enough for screws but not so hard to be difficult for axes and crampons. 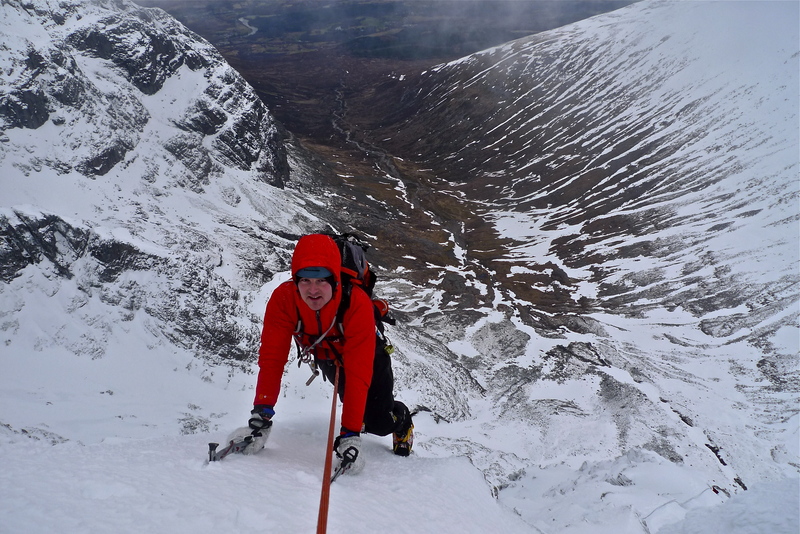 The wee chimney on the third pitch did provide some entertainment though with Lance getting a thorough pummelling by torrents of heavy spindrift – see video below. Above the easy neve slopes were in good nick with a good set up steps kicked in but a couple of the belays are difficult to come by. 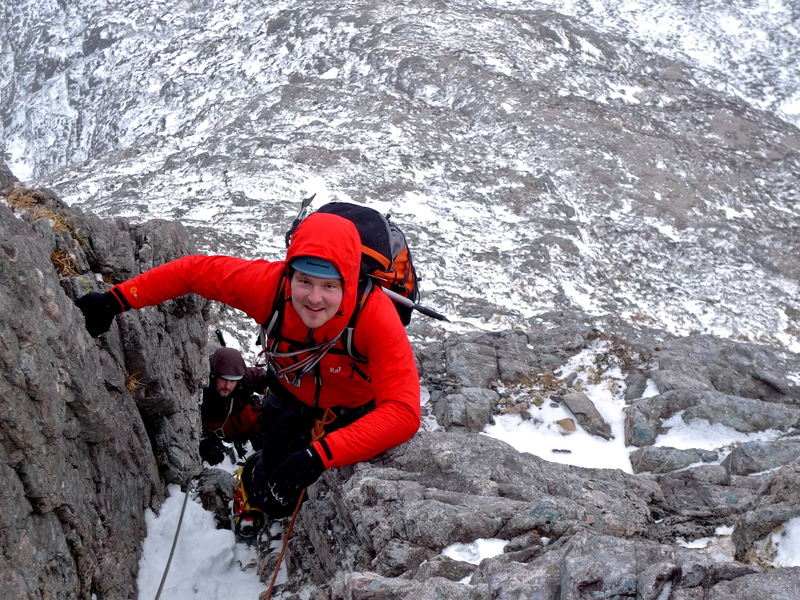 The guys on Sickle looked to be having fun, doing the route 30 years after they last climbed Hadrians – fair play! 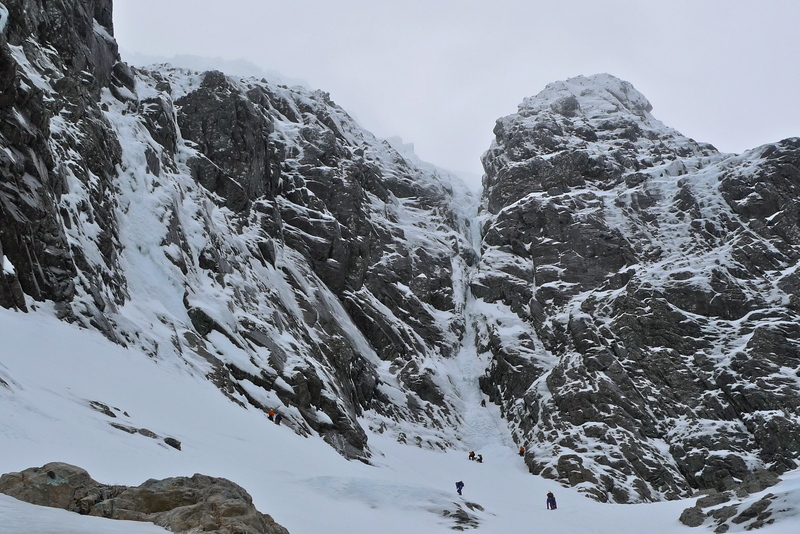 Lots of teams on Point 5 which seemed in much better nick than yesterday when we were forced to ab off after the first pitch due to slush-puppy ice. 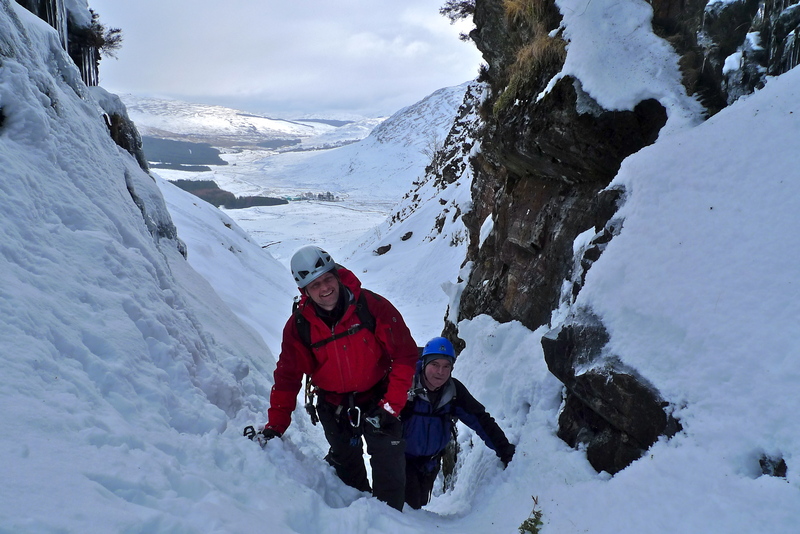 Posted in Winter, winter climbing | Comments Off on Hadrians Wall Direct, Ben Nevis – Great ice…. and a little spindrift! Matt and I had the day off today and unfinished business from earlier in the season. 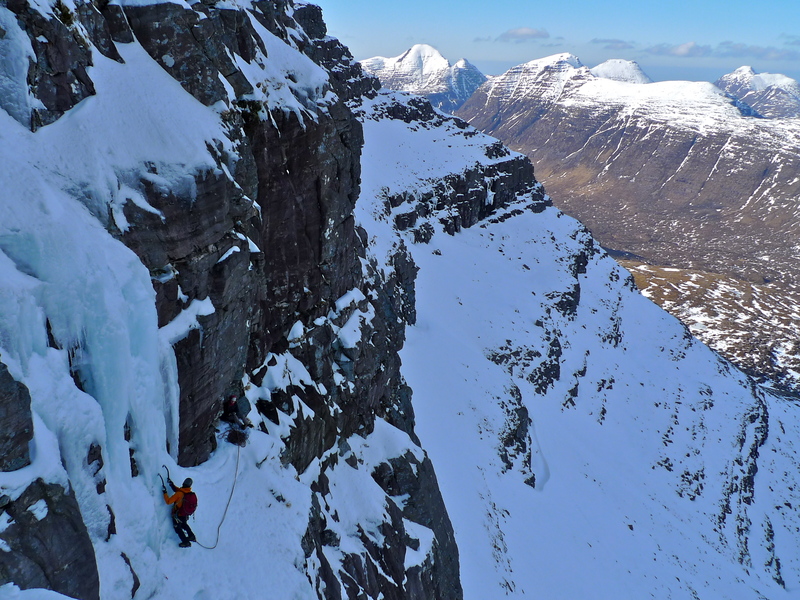 In January we had planned to climb Smith’s gully but at the last moment headed to Torridon for an adventure on Liathach. Today we made the long trudge in to Meagaidh and thought we might have blown it as it felt so mild and the rock all looked black and wet. Still if you dont go and look you’ll never know. Half way up Raeburns Gully things stopped dripping and the soft snow under our feet began to have the slightest sign of an icy crust. Spirits lifted again. 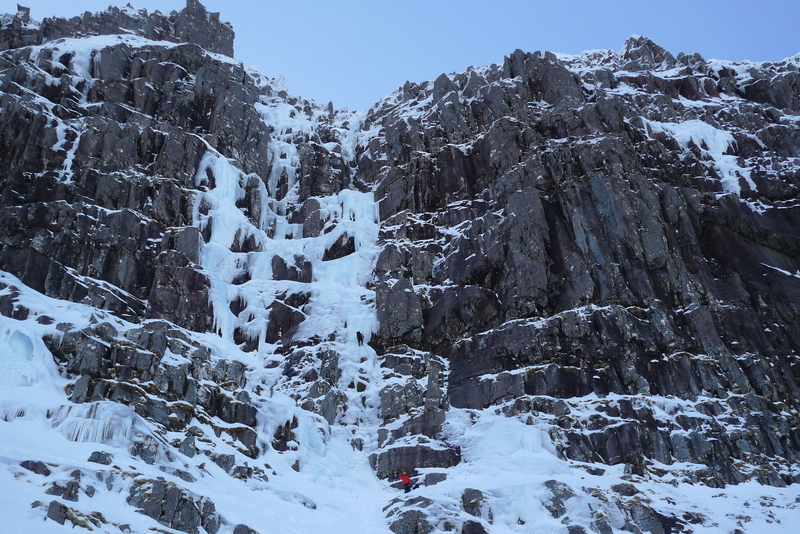 The ice on the route was still in good condition though on the lower pitches much of it was covered in 6 inches of cruddy snow that was hard work to clear. 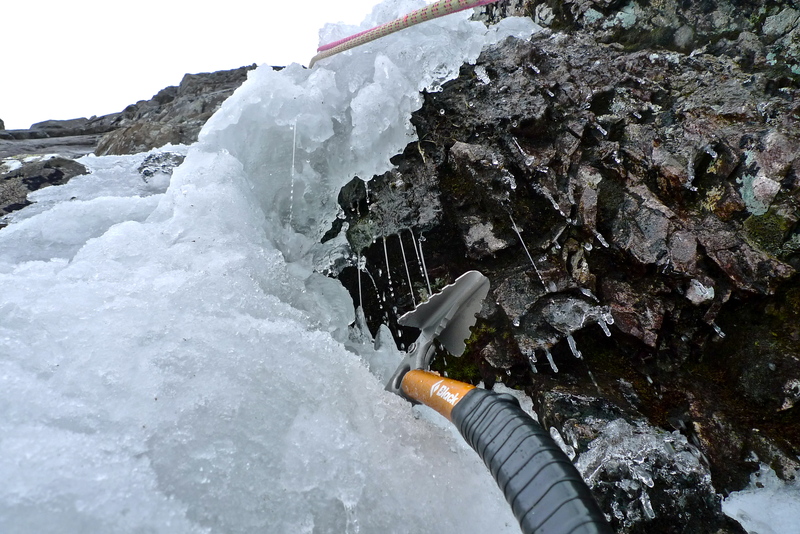 The ice on the last steep pitch was far better and free from crud and there was no cornice. On the summit by 2pm we decided to head and see was Pumpkin and the Wand looked like. Both looked in good nick (as did Diadem). 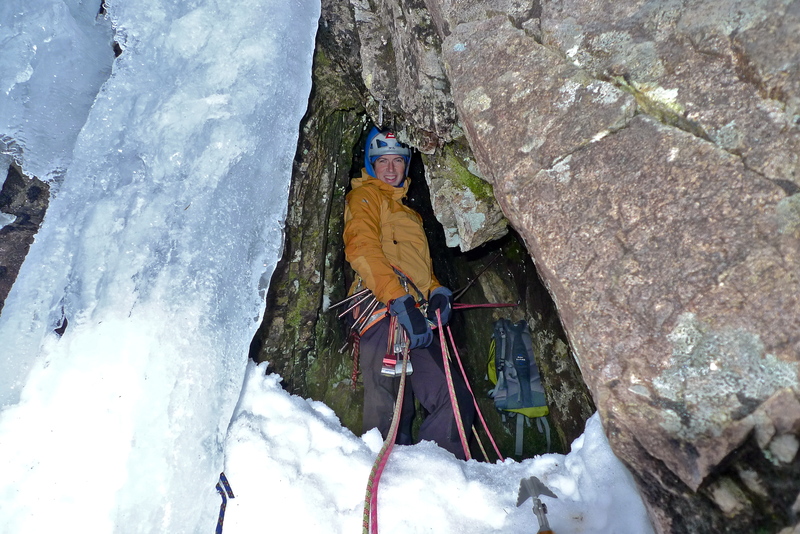 We chose Pumpkin and climbed the lower ice in 2 long 60m pitches before simul-climbing the easier ground to the top. The whole route is in very good condition with non of the cruddy snow found on Smith’s Gully. Thanks to Matt for today’s photos – guess who forgot there camera? A day off work and with a great forecast Baggy, Gaz and I decided to get a super early start and head up to Liathach in Torridon. It was -4 degC in the car park and the path on the walk in was completely clear of snow and in full sunshine. On cresting the lip of the corrie we left summer behind and back into winter – a full covering of hard neve and lots of ice. There was one team ahead of us on Poachers so we started up Salmon Leap. Baggy dispatched the slightly disconcerting fragile initial ice fringe and after that the ice got much better. At the end of the difficulties we rapped back down to the start of the main climbing on Poachers and climbed back up to the summit ridge. The views from there were amazing and it seemed a shame not to linger and enjoy the sunset but with a long drive ahead and commitments the following day we had to press on. The routes look like they should stay in for a while even with some slight thaw with only the upper groove on Poachers starting to get a little thin having seen a lot of traffic. Salmon Leap is the left hand icefall. Poachers is the right. 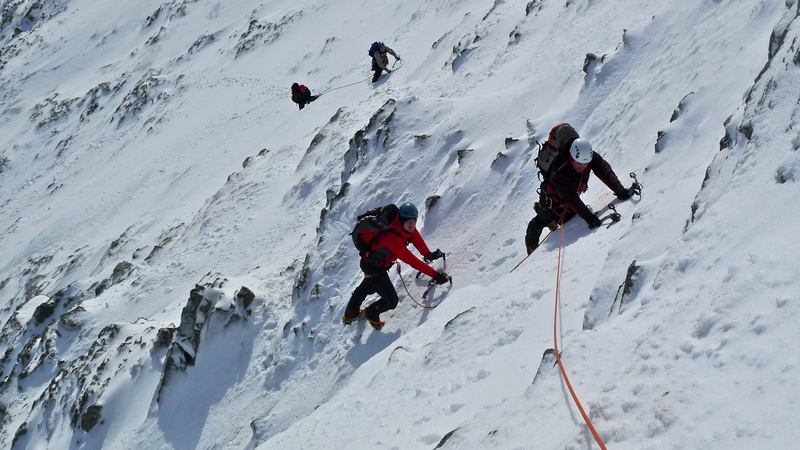 The second half of this week has seen me working on a Winter Mountaineering course for Jagged Globe. Despite slightly milder temperatures the low level ice just kept hanging in. 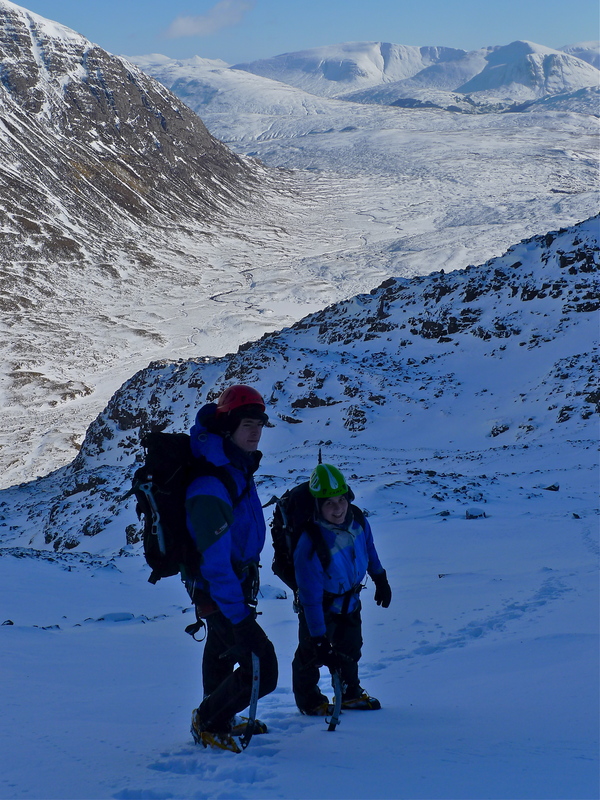 On Wednesday we went to Beinn Udlaidh and climbed West Gully and took a fantastic steep ice pitch as a variation to the last pitch. 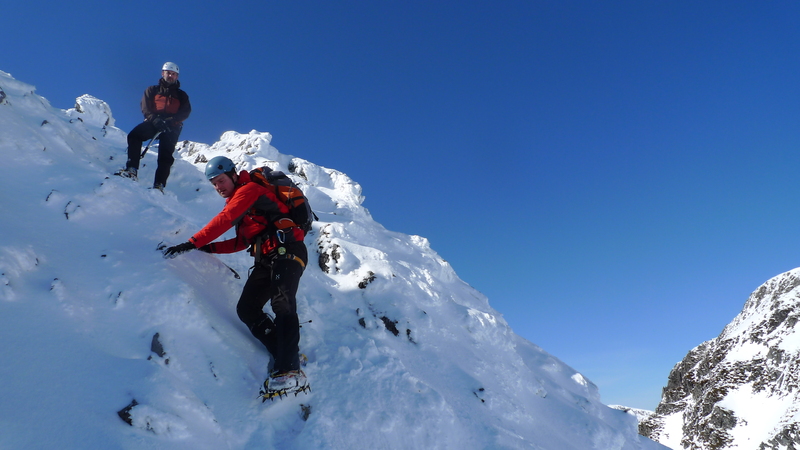 Thursday saw us on Sgurr na Finiseag climbing the icefall – Smoking the White Owl. The main pitch was still very solid but did give an amazing booming sound when you hit it! Friday saw us on yet another route I had never climbed. We drove South over Rannoch Moor to Tyndrum and along the private road to Ben Lui. 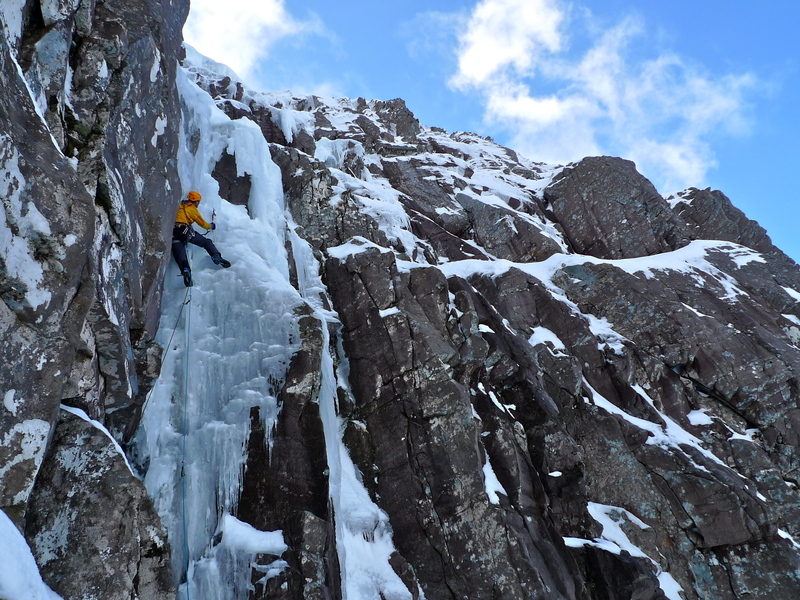 Eas Anie waterfall was still in good shape though the easy bottom pitches will not last long in this thaw. It is however possible to walk in to the foot of the main pitch which should last a little longer. The walk out was made more pleasurable when one of the workers from the gold mine kindly gave 6 of us a lift in his 4×4.